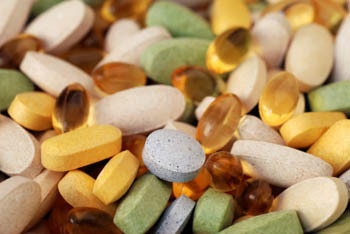 Home » Holistic Skin Care » What Vitamins are Good for Skin Problems? The basic vitamins for skin problems are A, C and E. But before you start taking a supplement or buy a cream containing them, read this article. The advice could keep you from making the problem worse. The benefits of A and E for the skin’s health are not well understood. The benefits of C are well known. So, let’s start with that. Vitamin C or ascorbic acid is a necessary cofactor for the body to produce strong collagen fibers. You may have heard of collagen. It is one of the things responsible for the skin’s elasticity, firmness and color. As we age, collagen production slows down naturally. During our youth, our body may produce weak collagen fibers if there is not enough ascorbic acid in our diet. In the worst case scenario, you could develop scurvy. Scurvy is accompanied by bleeding gums, pale skin-tone and depression among other unpleasant symptoms. Assuming you do not have scurvy, you need a minimum of 75-90mg per day. Much higher doses can be taken without causing any toxic effect. C is one of the vitamins for skin problems that have started to appear in anti-aging creams and similar products. Although the vitamin does have antioxidant effects, which could help minimize some of the signs of aging, it is also a mild acid. Applying any mild acids directly to the skin’s surface can cause burning, redness and irritation. I suggest you take C by mouth and use creams that contain other antioxidant ingredients. A is also known as retinol. Your body can produce it, as long as you consume enough vegetables or take a supplement containing carotenoids. Carotenoids are pre-cursors of retinol. The body converts carotenoids to retinol. It is not essential to consume retinol, itself. Unlike C, A is one of the vitamins for skin problems that can be toxic. High doses of retinol can cause death. A synthetic form of the nutrient is sometimes prescribed for severe cases of acne. Its use is reserved for the most severe cases, because it causes birth defects at any effective dose. When applied to the skin’s surface, it causes the same symptoms as ascorbic acid. The synthetic form is also acidic. Synthetic retinol creams have often been recommended for wrinkles. Research has shown that oils and extracts containing natural carotenoids may be just as effective, but do not cause the unwanted side effects. Avocado extract and Shea butter are examples of ingredients that contain natural carotenoids. We might not know why E is one of the most effective vitamins for skin problems, but when taken orally it seems to help with everything from acne to eczema and xeroderma; excessive dryness and flaking. Creams and oils containing E have long been recommended for minimizing the effects of aging. Researchers believe the benefits are due to the antioxidant activity of E. Antioxidants neutralize and prevent free radical damage, which is one of the primary causes of an aged appearance. A, C and E are only a few of the vitamins for skin problems. Any nutritional deficiency will eventually show up as a symptom on the outside of your body. A good multi-nutritional supplement and nourishing creams could be all that you need. It is also important to make sure your diet is well balanced and includes fresh fruits, vegetables, grains, fish and other lean proteins which are high in antioxidants such as Vitamin A, B, C and E. Antioxidants fight free radicals in your body and help the skin repair itself by producing the enzymes that stabilize collagen production, and keep skin moist and healthy.